On November 1st, Wolf D. Prix will be awarded the prestigious Hessian Culture Prize for Coop-Himmelb(l)au’s design of the new European Central Bank (ECB) in Frankfurt. A prize of €45,000 has been awarded annually since 1982 following the cabinet decision of the state government of Hesse for outstanding achievements in the fields of art, science, and culture. “With the new European Central Bank, COOP HIMMELB(L)AU creates a new, modern landmark for Frankfurt”, explains the eleven-member Board of Trustees established under Prime Minister Volker Bouffier (CDU) their decision. (Vienna, May 20, 2010) The groundbreaking of COOP HIMMELB(L)AU’s new premises of the European Central Bank has been celebrated yesterday in attendance of Jean-Claude Trichet, President of the European Central Bank, Petra Roth, Mayor of the City of Frankfurt, Wolf D. Prix, Design Principal and CEO of COOP HIMMELB(L)AU, the Governing Council as well as the Governors of the National Central Banks on the site of the future new premises of the European Central Bank. Furthermore, he describes the towers as archetypes of architectural history, which are symbols and convey overview. In the case of the European Central Bank the towers are aligned on the new site in visual connection to Frankfurt’s city centre and – due to their new typology with its precision and significance of form – will become an icon, a three-dimensional symbol of the European Union, Mr. Prix explained. Further groundbreaking events will take place on May 31, 2010 for the House of Music in Aalborg, Denmark and on June 18, 2010 for the Martin Luther Church in Hainburg, Austria. The location for the new headquarters of the European Central Bank (ECB) in Frankfurt’s Ostend district has the potential of adding a new landmark to the Frankfurt skyline that will be visible at great distances. 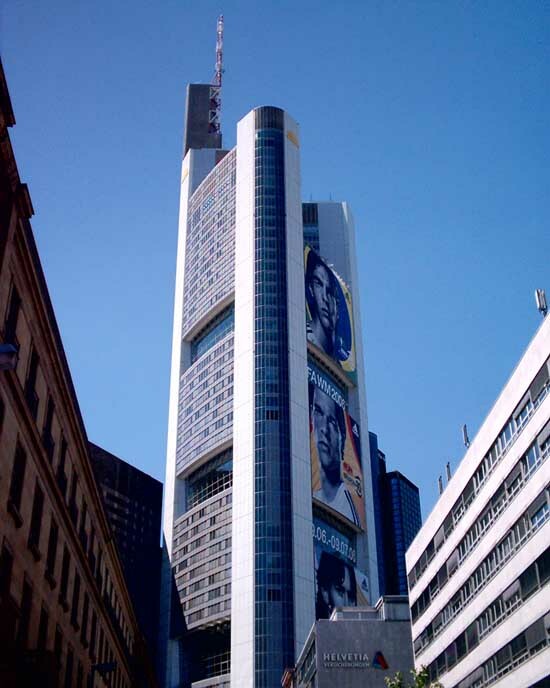 The starting point for the design of the towers was the urban perspectives of the city of Frankfurt. At a height of around 185 meters, the double tower, with its polygonal shape and east-west orientation, has a striking profile that is visible from all important reference points in Frankfurt’s city center, as well as from the river Main. Thanks to its form and presence, the double tower will become a characteristic feature of the Frankfurt skyline. The imposing form of the Grossmarkthalle (wholesale market), which so strongly characterizes Frankfurt’s skyline and the north bank of the river Main, unites with the vertical profile of the towers to form a significant ensemble that considers both the local urban design environment and the general urban spatial context, thus creating a tension between Frankfurt’s banking district and the Ostend area. By concentrating the ECB’s functions in the Grossmarkthalle, the south side of the premises, facing the Main, can be largely kept free of construction. The prominent view of the south side of the hall from the Main embankment with the clearly visible profile of the high-rise emphasizes its special position. The tower ensemble is the result of a design process inspired by the urban links with the city of Frankfurt. Owing to its clear orientation towards the important urban perspectives, the ensemble enters into a dialogue with the important urban reference points in Frankfurt: the Alte Oper, the Museumsufer and the financial district. Starting with the economical typology of a double-slab high-rise, a second design step combines the urban planning specifications with the geometric transformation of the towers, in order to generate a multi-faceted building structure while preserving its urban significance. The atrium between the office towers becomes a “vertical city”. Through platforms we are creating spaces, plazas and pathways between the towers, just as they exist in a city. The connecting and transferring levels divide the atrium horizontally into three sections of different sizes, with heights ranging from around 45 to 60 meters. 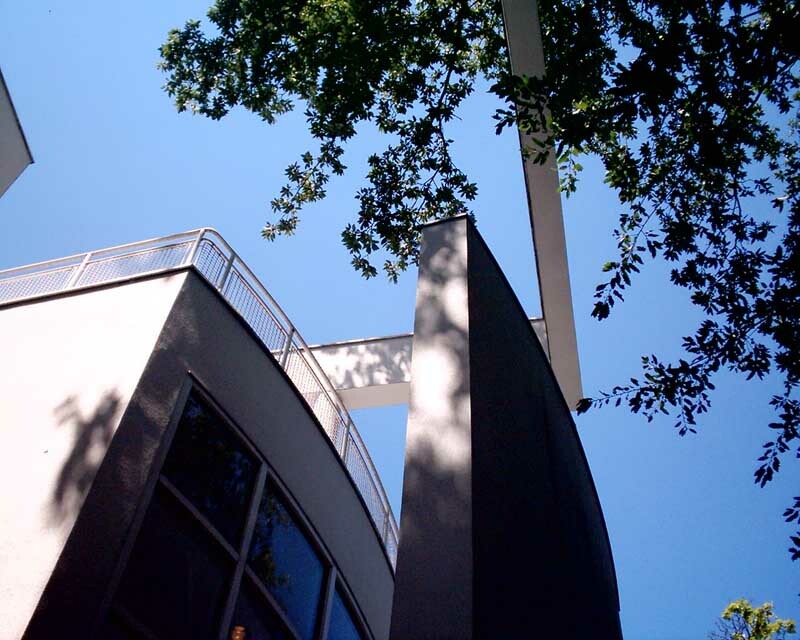 These connecting platforms, bridges, ramps and stairs form a network of links between the office towers. They create short paths between the individual office floors in each tower and thus enable larger, interconnected usable office spaces on one or more floors in both towers, thereby also promoting informal communication. This new typology supports a dynamic development of form and enables differentiated office spaces with different panoramic perspectives. Our design reinforces the Grossmarkthalle’s existing potential as an “urban foyer” housing a conference and visitor center, as well as a library and restaurant, through the incorporation of a building for the press center which traverses the structure of the Grossmarkthalle. This so-called entrance building, in which ECB press conferences will be held, occupies a special position in content, form and space and thereby marks the entrance to the ECB. Since the western parts of the Grossmarkthalle were reconstructed after being destroyed during the Second World War and do not, therefore, represent part of the substance of the original building – even in the way they are constructed – we propose, as agreed with the historic preservation authority, that the incision for the new entrance to the ECB be in this part of the hall. We continued to develop the concept of integrating the extensive functional areas into the Grossmarkthalle, as suggested during the Optimisation Phase. As before, the required new facilities are being placed in the spacious interior of the hall as independent building structures (the “house within a house” concept). The building structures, which are at diagonal angles to the Grossmarkthalle, allow the hall to be experienced along dynamic spatial sequences – and this not only in the public areas of the hall’s ground floor, but also on the upper levels, which, with their conference and restaurant facilities, are largely reserved for employees of the ECB. The restaurant structure, as a visible sign of the new functional areas in the hall, generously orients the employee restaurant and terrace towards the Main in the south.